Itohs are the darlings of peony lovers everywhere. Their performance alone—superior throughout the decades with hardly any maintenance—make them a worthwhile investment. However, with this collection they're an even greater value. We'll give you three top varieties selected by our experts for great savings over buying them individually. 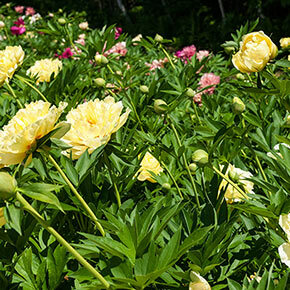 Itoh peonies come from a cross that was once thought impossible, between herbaceous and tree peonies. The result is even greater than anticipated. A dense, rounded, herbaceous habit with lush foliage that stays nice all season long provides reliable structure through the ages. Then, in an Itoh's blooms, you'll see the tree peony influence. Beauty abounds in the wealth of unique, large flowers. In fact, Itoh peonies are the most vigorously flowering of them all. Once mature, you'll get over 50 blooms through an extended six-week period. Itohs can also take more heat and cold. Pollinators love peonies, yet deer won't bother. 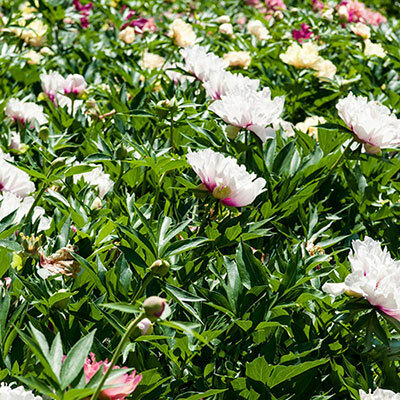 Peonies have few requirements: give them a sunny well-drained location, plant 2-4' apart, with the eyes (new buds at the crown) no more than 2" below soil level and apply fertilizer or compost in spring. Healthy peonies take time to establish, often 3 years before they start blooming—but the wait is worth it. They are heirloom quality. Let them grow undisturbed and they will bring joy to you and your loved ones through the decades. Plus, even before they begin producing blooms, you can depend on a handsome foliage display from spring through fall. Watering Requirement: Water regularly first season to establish root system. Once established water deeply, less frequently.